This is Camp Fontanelle's largest event of the season. It is a time to get meet up with friends and family and celebrate a successful summer out at Camp Fontanelle. Tour the campgrounds, eat a good meal and learn about the ministry at Camp Fontanelle and all that is happening throughout the year. There are plenty of activities to keep you busy throughout the day in the Riverview Lodge (main lodge) area. Get your face painted, eat a hamburger or hotdog, or maybe some pulled pork of grilled chicken, bounce in a Bounce House. There will be informational videos playing about a successful summer camping season or learn about our Capital Campaign to build a new retreat center. The day will start with a worship service under the Big White Tent at 11:00 a.m. At noon, the food stations at Riverview Lodge and the Grilling Station at the gazebo will be open for serving. 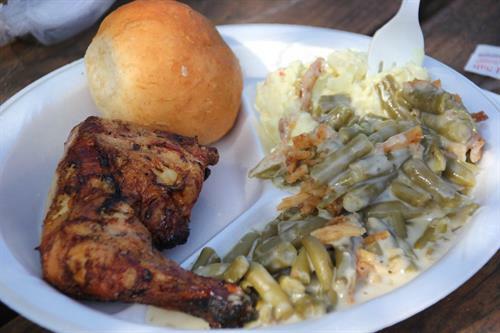 The Lodge will be serving pulled pork or grilled chicken with sides and a drink. The Grilling Station will have grilled hot dogs and hamburgers with chips and a drink. This year we are pleased to have the Bishop of the Great Plains United Methodist Annual Conference, the Rev. Ruben Saenz, Jr., giving the message during the service. Stick around for the Silent and Live Quilt Auction, beginning at 12:30 and 2:00 respectively, or head up to the top of the property and enjoy the Pumpkin Patch and corn maze. It opens at 1:00 p.m.
And while you can participate in many activities at no cost, it is a fundraiser for the camp and donations are greatly appreciated to help further its mission of being an intentional Christian community, providing wholesome and fun activities for families and individuals throughout the year. This is the largest fundraiser for the camp and we are grateful for our dedicated supporters. It's a short 15 minute drive from Fremont. 11:00 a.m. Worship with Bishop Ruben Saenz, Jr.
Silent and Quilt Auctions - whatever you are called to bid!